Prime Minister Modi's visit to Israel from July 4 to July 6 was historic being the first Prime Minister of India to visit Israel. If the Israeli paper 'Marker' wrote on June 28 "Wake up: the most important PM of the world is coming", Modi's visit from India's viewpoint too was perhaps most significant. It de-hyphenated the previous Indian governments' stance of not only clubbing Palestine with Israel but also refraining from a prime ministerial visit Israel. The current crib of Congress and leftists in India that Modi's Israel visit is disregarding Palestine is nothing but political garbage because in May 2017 India hosted Palestinian President, Mahmoud Abbas on an official visit, who described India as a "Dost". India sought to elevate its ties with Palestine reinforcing its stand on a two-state solution and offered a slew of capacity building projects. Both India and Palestine decided to strengthen cooperation enabling information sharing and perspectives to fight international terror during wide ranging discussions between Modi and Abbas. Modi had visited Israel earlier as Chief Minister of Gujarat. His visit as PM now marked completion of 25 years of India-Israel diplomatic relations. July 4 is also historic for Israel being the date on which the world famous 'Entebbe Raid' was successfully launched by Israel in Uganda to rescue 106 Israelis held hostage. This raid (on 4 July 1976) was led by Lieutenant Colonel Yonatan Netanyahu who succumbed to his wounds during the return flight after rescuing 102 Israeli hostages. Yonatan was elder brother of Israeli Prime Minister Benjamin Netanyahu. PM Modi mentioned the Entebbe raid during his visit to Israel. Though India voted at the UN against Israel in July 2014 when the Modi government was new, this was righted in 2015 when India among five countries abstained from voting against Israel on a UNHRC resolution seeking action against Israel for alleged war crimes, which was repeated in 2016 also. 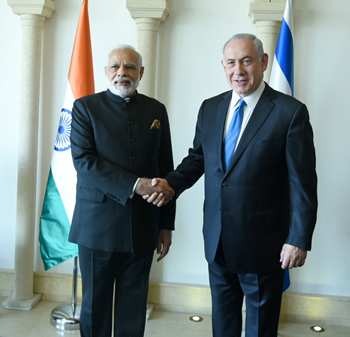 With Modi in Israel, the bonhomie between India and Israel (both continuously targeted by terrorists) was palpable, in addition to the deep personal rapport between PM Modi and PM Netanyahu. Even Israeli President Riuven Rivlin swept aside protocol by himself receiving Modi at his gate when Modi went to call on him. Warm and friendly phrases like 'my friend', 'made for each other', "sister democracies", 'a match made in heaven' were the norm during Modi's visit, with PM Netanyahu accompanying PM Modi everywhere during the entire course of his three-day visit. 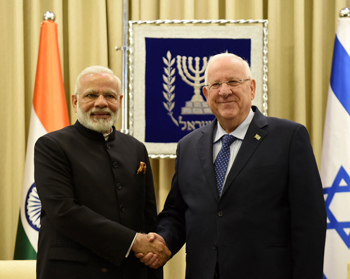 Wide ranging discussions were held between the two PMs, besides Modi's discussion with President Rivlin. For obvious reasons, the talks went much beyond what has been made public, as was hinted. The Modi-Netanyahu meeting focused on defence and security, counter-terror cooperation and global and regional security assessments. Both counties elevated their ties to a Strategic Partnership' with India identifying Israel as a major developmental and technological partner even as both nations agreed to combat growing radicalization and terrorism and expand cooperation in cyber security. Post discussions with Netanyahu, Modi said, "PM Netanyahu and I agreed to do much more to protect our strategic interests. We will also cooperate to combat growing radicalisation and terrorism. Our cyber security authorities will exchange expertise and knowledge to tackle this menace in cyber space." Cooperation in Electric Propulsion for Small Satellites. While Israel will help India conserve water and clean up Ganga, PM Modi announced setting up of an Indian Cultural Centre in Israel to enhance people-to-people contact. India has announced a Delhi-Mumbai-Tel Aviv flight and more flights are likely to be added. Modi met the Indian community in Israel as also Moshe Holtzberg, the child survivor from Chabad House during 26/11 where his parents were killed. Modi also visited the Holocaust Remembrance Centre Yad Vashem, paid homage to Indian soldiers at the cemetery at Haifa. Both PMs presided over the first India-Israel CEOs Forum, with some 30 CEOs from both nations attending. Indian and Israeli companies signed strategic pacts worth $4.3 billion excluding defence. The CEOs were showed happiness over the $40 million innovation fund MoU signed but urged both governments to restart discussions for a free trade agreement (FTA) and investment protection pact to deepen economic ties. PM Modi's visit to Israel was preceded by NSA Ajit Doval, Navy Chief Admiral Sunil Lamba, and an 11-member Parliamentary delegation, besides others. India is presently Israel's biggest arms market, with $2.6 billion arms deals inked in 2017 alone, including the largest ever defence contract for Israel Aerospace Industries (IAI) totaling $2.0 billion in April 2017 to provide advanced MRSAM air and missile defense system (Barak-8) to Indian Army as well as additional LRSAM air and missile defense systems for India's first indigenously built aircraft carrier 'Vikrant'. 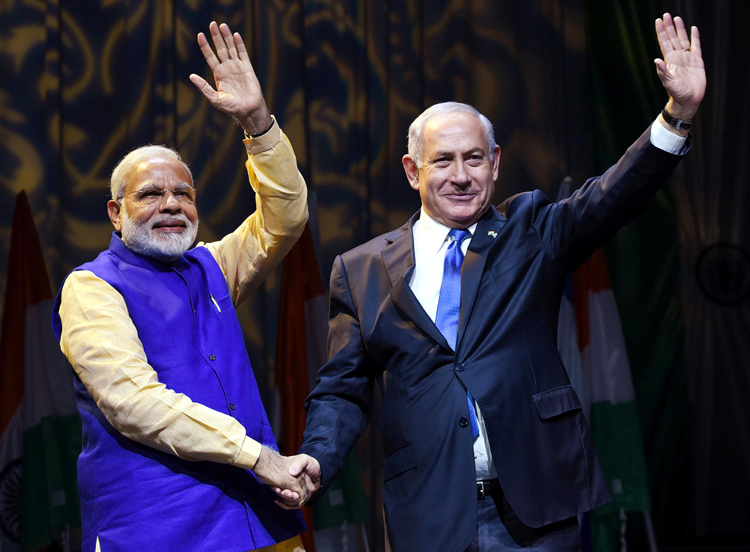 Israeli defense firms are responding enthusiastically to Modi's "Make in India" policy by stepping up collaborations with local companies and gearing up to supply India with drones, radar, communication systems, and cyber-security support. The highly successful visit by PM Modi to Israel will result in giant leaps of the expanded strategic partnership in areas such as defence, cyber security, space technology, water, agriculture, development, innovation and R&D. The expansion of 26 Israeli set up agriculture expertise centers in 15 Indian states is on the cards to help Indian agriculture improve its productivity. In Israel, PM Modi had stated, "India has suffered firsthand the violence and hatred spread by terror, so has Israel. PM Netanyahu and I have agreed to do much more together to protect our strategic interests and also cooperate to fight growing radicalization." This should be seen in context of the growing terror threat from Pakistan fully backed by China; Pakistan giving free hand to terrorists like Masood Azhar, Hafiz Saeed and Syed Salahudeen with China shamelessly backing them even at the UN. Referring to the Modi-Netanyahu discussion, Foreign Secretary Jai Shankar noted ""They visualized the two countries will become close partners in development, technology, innovation, entrepreneurship, defence and security." This should become reality rapidly. PM Modi invited PM Netanyahu to visit India, which the latter accepted instantly. 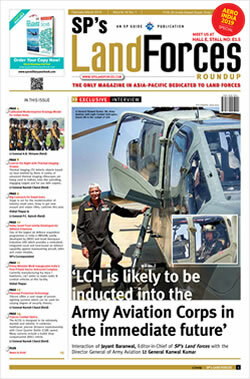 His visit should take India-Israel ties to another higher level – where even sky is no limit.